On 25 January 2005, Société des Produits Nestlé S.A. applied to register the word trade mark CHOKELLA Z-290315 in Class 30, for goods such as: breakfast cereals, muesli, corn flakes, cereal bars, cereal flakes, cereal preparations, food products based on rice, flour or cereals, also in the form of ready-to-use meals. 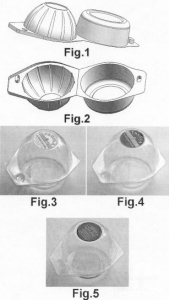 Nestlé was aware that there is a possiblity that the Polish Patent Office rejects the application because of the earlier registration of the trade mark CHOKELLA R-85159, registered with priority on 30 August 1993 for the Company Kelsen The International Bakery A/S from Norre-Snede, which during Nestle’s application was under the grace period based on the provisions of Article 132(1)(iii) of the Polish Act of 30 June 2000 on Industrial Property Law – IPL – (in Polish: ustawa Prawo własności przemysłowej), published in Journal of Laws (Dziennik Ustaw) of 2001 No 49, item 508, consolidated text of 13 June 2003, Journal of Laws (Dziennik Ustaw) No 119, item 1117, with subsequent amendments. (iii) a trade mark earlier registered in the Republic of Poland, whose registration has terminated, provided that an interval between the date of lapse of the right of protection for the trade mark and the date on which a similar trade mark has been applied for by another party, is, subject to Article 133, no longer than two years. On 3 February 2005, Nestle filed before the PPO a request for a declaratory decision which would affirm the lapse of the right of protection for the trade mark CHOKELLA R-85159, because of its non-use. According to Nestle, the declaratory decision should be effective from the date when an event which involves the effect of the expiry occured, i.e., at the date when the 5-year time period of non-use of a trade mark expired. On January 2006, The PPO, dismissed the proceedings on the grounds that it was pointless, since before the date of Nestle’s request the rights of protections for CHOKELLA trade mark expired on 30 August 2003, under the law, due to the failure to extend the protection for the next ten years. It was unacceptable for the PPO to decide on the lapse of the rights of protecion for a trade mark, which did not exist at the date of application for such declaration. The PPO indicated that Nestle’s request was filed almost two years after the expiry of the CHOKELLA trade mark, so dismissal of the proceedings was justified because of the lack of subject that would be suitable for a substantive judgment. The PPO ruled that the right of protection shall expire on the date of the decision with effect from the date of filing a request to declare the right of protection for the trademark lapsed. So the decision has a constitutive nature and is applicable ex tunc. The PPO did not agree with Nestle’s argument, and the construction and interpretation of the provisions of Article 169(2) of the IPL. The Patent Office shall make a decision on the lapse of the right of protection for the trade mark at the request of any party having a legitimate interest therein. The PPO decided that this prejudge the declaratory nature of the decision on the lapse of the rights of protection and it differs from the provisions afforded in the old Polish Act of 31 January 1985 on Trade Marks – TMA – (in Polish: Ustawa o znakach towarowych), published in Journal of Laws (Dziennik Ustaw) No 5, item 15, with subsequent amendments. (v) on termination of economic activity on the part of the owner of the right deriving from registration of the trade mark. In those cases referred to in section 25, items ii) to v), the Patent Office shall cancel the right deriving from registration of the trademark. (1) Any person having a legitimate interest may submit a request for confirmation of lapse or a request for annulment of the right deriving from registration of a trade mark. In the PPO’s opinion the provisions of article 169(2), beside different nomenclature of institutions (i.e. registration rights in the TMA and the rights of protection in the IPL), are identical and, even if the TMA did not indicate the date on which the lapse of registration rights or rights of protection, the legal doctrine and the case-law have established a method of calculating such date based on a specific event, for which it is considered the date of filing the request before the Patent Office to decide on the lapse of the right of protection for the trade mark. Nestle filed a complaint before the Voivodeship Administrative Court in Warsaw, and argued that, contrary to the PPO findings, the IPL quite differently regulates the rules of declaration on the lapse of the right of protection for the trade mark. The Office shall issue a decision on the lapse of the rights of protection for trade mark and the provisions of Article 169(2) of the IPL indicates clearly that the decision is a declaratory act with a constitutive effect, that is, the decision itself, does not abolish the rights, but merely states that the right is expired under the law, which has effect for third parties from the time it was decided. The Voivodeship Administrative Court in Warsaw in its judgment of 12 December 2007 case file VI SA/Wa 791/07 dismissed the complaint. The Court agreed with the PPO’s findings. Nestle filed a cassation complaint before the Supreme Administrative Court. The Supreme Administrative Court in its judgment of 21 January 2009 case file II GSK 668/08 annulled the ruling of the Voivodeship Administrative Court. First, the Court noted that the Supreme Administrative Court in its judgment of 23 April 2008 case file II GPS 1/08 held that according to the provisions of Article 169(1)(i) of the IPL, the date of lapse of the right of protection for a trade mark is set on the last day of a period of five successive years, counting from the first date of non-use. See also “Trade mark law, case II GPS 1/08“. The SAC ruled that aforementioned judgment can not be excluded from the examination of the matter of Nestle’s complaint. According to the Court, it is accurate and consist of compelling arguments that are sufficient to answer the question formulated in Nestle case. The Court held that the similarity of the nature of “industrial property” within the meaning of property in the civil law context is in the exclusive use of goods that are understood as property, the beneficial use and disposal of such goods. However, the industrial property differs because its formal nature that is resulting from the relationship with a decision on granting the rights of protection, invalidation and the lapse of rights of protection. The decision to grant the rights of protection for a trade mark mark is clearly a constitutive act creating the legal status for a person. Declaratory decisions can not determine the occurrence of the new legal situation, but must refer to another fact or event occurring earlier in time and combine them with the rights or duties of the entity (legal or natural person). The vague regulations of the TMA encouraged the formulation of views on the constitutive nature of the decision on the lapse of the registration rights of a trade mark under article 26 and 30 of the TMA. The SAC did not agree with two separate opinions issued by judges who were appointed to decide in case II GPS 1/08 and article written by professor Ryszard Skubisz and Marcin Trzebiatowski in which the authors provided examples on declaratory and constitutive nature taken from family law or labour law. According to the Court, the difficulties arise when the vague provisions of formal law create the need for an interpretation if, in connection with the answer to the question of when and on what basis (fact, event, operation), the decision has constitutive or declaratory nature. It was incomprehensible for the SAC to give the examples of judgments of nullity of marriage or fatherhood, the effects of which can not be transferred by the declaratory act on the life of the party in the family and the society. The Court held that similarities between industrial property and the instutution of the property taken from the civil law (property and ownership of tangible goods) should be taken into account to justify the recognition of decision on the lapse of the rights of protection as declaratory one instead of the principles of family law. The Court analyzed the nature of such decision in the scope of the property law rules i.e. the acquisition of property (perpetual use of the property or servitude of the ground) is decided by the declaratory ruling of the civil court following the expiry of the last day of the period when such possession is required by the formal law. The SAC also stated that the day of filing the application for declaration on lapse of the rights of protection does not affect the date of expiry of the right, because it is initiating administrative action on the request of the parties. Whether and when the rights of protection shall lapse should be declared by the findings made during the proceedings for the purposes of the law. Categories: Art. 105 §1 APC | Art. 132(1)(iii) IPL | Art. 133 IPL | Art. 153 IPL | Art. 168 IPL | Art. 169(1)(i) IPL | Art. 170 IPL | Art. 172 IPL | Art. 25 TMA | Art. 256 IPL | Art. 30 TMA | Polish Act on Industrial Property Law | Polish Act on Trade marks | Polish Administrative Proceedings Code | Polish courts | Polish institutions | Polish law | Polish Patent Office | Polish Supreme Administrative Court | trade mark lapse | trademark law | Voivodeship Administrative Court.